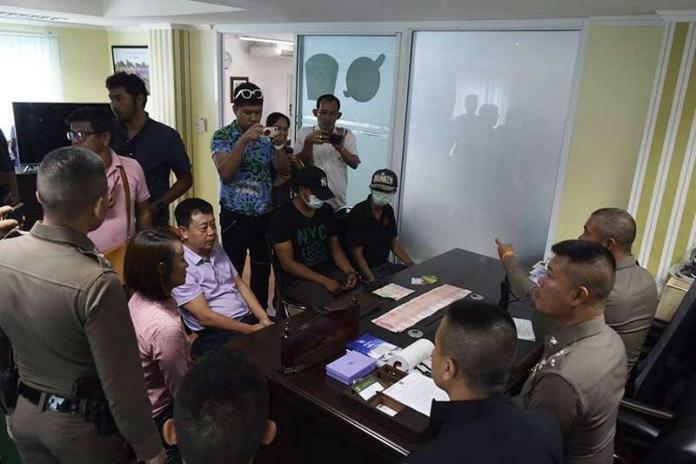 A Chinese tourist, Siaw Yin Go, 51 years old, had his bag containing 35,000 baht snatched while on tour in Pattaya near Naklua on September 12th, 2018 around 8:00PM. The three thieves, who are Chinese-Thai and are believed to have done this in the past in the Pattaya area, distracted Mr. Go and pretended to join the tour group. One individual spoke to Mr. Go in fluent Mandarin, gaining his attention and causing the distraction while the other two snatched the bag and fled on foot. The leader of the tour group and other members of the group helped chase the thieves and detain them until police arrived. Two of the three thieves were captured, Mr. Kapthong Sae-Yang, 21, from Chiang Mai and Mr. Denrak Sae-Lor, 31, from Yala. The third individual in the bag snatching gang, the individual who distracted Mr. Go and pretended to be a member of the group, joining them as they walked around, escaped and is on the run, however, police have identified him and are on his trail. The two men arrested have been charged with theft under cover of darkness and are currently in Pattaya Remand Prison awaiting trial.